The latest in the line-up of Givenchy’s Gentlemen Only fragrances, Casual Chic remains true to the original accords of Gentlemen Only - sandalwood, cedar wood, birch leaf, but with the addition of three spices – cardamom, ginger and juniper. TheChicGeek says “The modern man likes a trilogy, and 'Casual Chic' finishes this off nicely for Givenchy’s Gentleman Only series. This is a modern grown-up fragrance, which means it’s masculine, but easy. 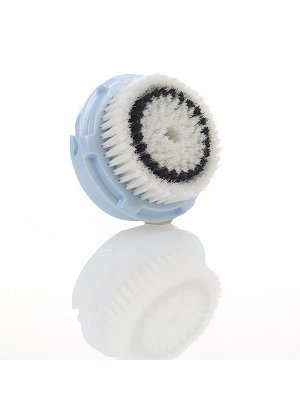 The oval-shaped brush head of Clinique’s Sonic System Deep Cleansing Brush was specifically designed to deliver targeted cleansing in the hard-to-reach, contoured areas of men’s faces including around the nose, hairline and chin. Charcoal-infused bristles draw out debris to help keep skin clear. 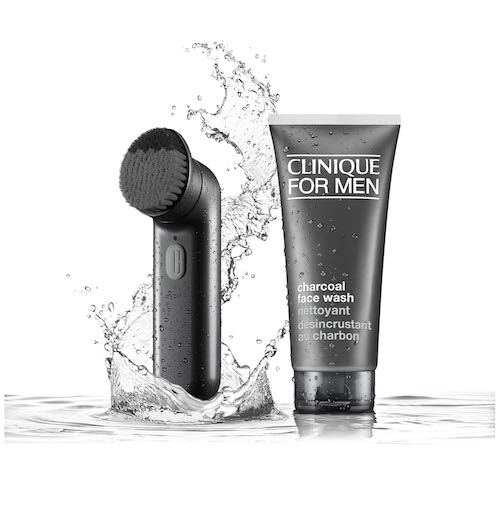 To complement the sonic cleanser, the Clinique for Men Charcoal Face Wash is fueled by the purifying powers of bamboo charcoal removing dirt, debris and surface oil for tired, stressed and congested skin. Ingredients such glycerin attracts water to the skin to restore suppleness while also forming a barrier against future moisture loss and caffeine, an anti-irritant, helps to nourish and soothe skin irritation from razor burns and nicks. TheChicGeek says “Men love gadgets and this is what Clinique is banking on, here. I’ve tried the Clarisonic face cleanser before – here - the first of this type of face cleaner when it launched 5 years ago, and this is much gentler. Sonic cleansing is a gentle way of giving your skin a thorough clean. Right - TheChicGeek trying out the new Clinique For Men Sonic System Deep Cleansing Brush. So delicate no ginger paint was removed! While they already have a female version of this, Clinique say they simply haven’t coloured it grey and repackaged for us guys. It’s the charcoal that makes all the difference, don’t you know! It’s a very light and simple design. You do have to believe though. Are you a believer? *raises hands into the air* It’s so soft and gentle you have to imagine it working, rather than feel it. This isn’t a power tool that you can use on the woodwork after, even though we’d probably like that! It’s a delicate sonic cleanser which should be used for 30 seconds at a time. You will have to fight the urge to really rub your face with it. Those 30 seconds go fast and you have to move it around your face quickly. You put your chosen face wash onto the brush - you don’t have to use the new charcoal face wash, which doesn’t come with it - then turn it on. Expect a box set with both products come Christmas time. (My only beef with these dark face washes or clay scrubs is that they tend to stain the skin dark and give you somewhat of a grey John Major type appearance). Being realistic I’m only going to use the sonic brush once a day, in the morning, while in the shower. Initial impressions, I didn’t see any noticeable differences or feelings of cleanliness from my regular routine. The 30 seconds feels too short a time to get around the whole of your face and neck. My feedback – The stand, which is good, should be detachable from the charging cable and should come with an optional ‘sucker’ so you can stick it on the wall in the shower. This will stop it from lying down and allow it to dry out between uses. It lasts 180 minutes, which means you’ll hardly ever have to charge it, which is one of the bugbears of bathroom gadgets. A stimulating body cleanser that transforms into a rich lather to draw out impurities without drying the skin. It contains kaolin – a white clay that absorbs oil and impurities to cleanse the skin, ginger root extract which stimulates circulation and glycolic acid which helps refine skin texture and improves radiance. TheChicGeek says “This is very light for a clay cleanser. The pure white colour is better as dark clay scrubs can stain the skin. It has a zesty lemon fragrance and you’re encouraged to work it up from the legs to the upper body – this must be for the circulation part. CULT51 is a multi-active night cream, developed over two years, that combines the most scientifically advanced ingredients at the highest concentrated levels. It’s named CULT51 after its 51 anti-aging claims. The active ingredients in this product work together with your skin’s own molecules to encourage growth and the generation of new skin cells, dramatically slowing the ageing process of the skin whilst also brightening and evening out skin tone. CULT51 contains concentrated solutions of Botanical Heteropolysaccharides, Mannitol, Yeast Extract, Amino Acids and Peptides, Pomegranate Extract, Japanese Seaweed Extract, Vitamins B1, 2, 3, 6 & 12, Amino Acids, Oligopeptides, Walnut extract providing Phytic Acid and Polyphenols, UC Peptide, Synthetic Tripeptide, Liquorice Roots Extracts, Peach Kernel Extract, Vitamin E Complex, Hyaluronic Acid, Aloe Vera Juice, and a stabilised Vitamin C Complex. TheChicGeek says, “Night creams are definitely something guys should consider as they get older. The skin does a lot of its repair work at night, so anything which aids and helps replenish this is surely welcome. This is touted as an all singing and all dancing anti-aging cream. (Aren’t they all?! )The name and branding does look a bit 80s nightclub. That aside, the cream is rich and thick and it smells a bit like rubber. Still on the fence over whether I like this. I’m always a bit dubious about rich creams on guys’ skin, as they are often too rich and cause spots and breakouts. This didn’t. The main ingredient is ATP, which is also known as ‘fuel for life’, which naturally diminishes as you age. This product is said to increase that by up to 65%. Also, as we age, we reproduce half the amount of hyaluronic acid we require, this is what holds on to the moisture in our skin, up to 1000 times its weight, but this chemical also reacts with light, so it good to be used, as here, in a night cream. Did I wake up looking refreshed and plumped? Yes. Update - "More people than usual have been saying how well I look. It could be the CULT51!" TheChicGeek says "Standing in the shower like Patrick Bateman holding the Clarisonic face cleaner to my face as it whirls and beeps away, leaves me thinking I should be in a scene from the film 'American Psycho'. The Clarisonic cleaner is a solid, waterproof bit of kit which is very gentle on the skin. It shows how you can exfoliate without being too rigourous. As men, we like to sandpaper our faces in order for them to feel exfoliated. With this you gently move it around your face not applying too much pressure. You wet the brush head and your face and put a cleanser on your face or brush head, whichever you prefer. Push the button and start around the cheek/nose area. It beeps when it is time to move to a different part of the face and then stops so you can’t over clean your face. It all takes about 60 seconds. It has another detachable head that can be used on the body, and you can change the speed settings to increase or decrease the head speed. I think the Clarisonic cleaner would be great if you are prone to acne breakouts on your body particularly the back. I would recommend using the Clarisonic twice a week for exfoliating your skin. Anymore and it will leave the skin too dry, stripping it of any oils. If you have extremely oily skin then maybe use it more. I would suggest applying quite a rich moisturiser after - the Clarisonic also allows for creams and moisturisers to be absorbed better. I found my skin looked much smoother and healthier after a couple of weeks of using it and my pores were less visible which encourages me to carry on using it." If you like your grooming toys then this is perfect.